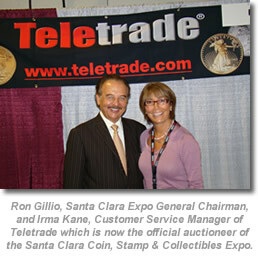 Teletrade, the largest fully-automated telephone and Internet auction company for certified coins, paper money and sportscards, has been named the official auctioneer of the twice-a-year Santa Clara Coin, Stamp & Collectibles Expo beginning with the next show, November 19 – 22, 2009, in the Santa Clara, California Convention Center. The deadline for consignments for the Santa Clara auction is November 2. "The timing of the regularly-scheduled Teletrade auctions in conjunction with the Santa Clara Expo will be excellent for buyers and sellers across the country as well as those who come to the show in person," said Ronald J. Gillio, Expo General Chairman. "Each Santa Clara Expo is held Thursday to Sunday. Teletrade will close its scheduled Sunday auctions those two weeks each year on the last day of a Santa Clara show.In addition to the usual online lot viewing, bidders will be able to inspect Santa Clara auction coins in person at the show prior to the close of bidding." Teletrade conducts three coins auctions every week on Sundays, Mondays and Wednesdays. "All items offered in Teletrade auctions are certified by Professional Coin Grading Service (PCGS), Numismatic Guaranty Corporation (NGC), ANACS or Independent Coin Grading (ICG). We have over 175,000 registered bidders, and we are the largest and most active marketplace in numismatics," said Ian J. Russell, President of Teletrade. For additional information about consigning or bidding, contact Teletrade at (800) 949-2646 or visit online at www.Teletrade.com. For additional information about the Santa Clara Coin, Stamp & Collectibles Expo, call (805) 962-9939 or visit online at www.SantaClaraExpo.com. The Santa Clara Expo is a division of Collectors Universe, Inc. (NASDAQ: CLCT).